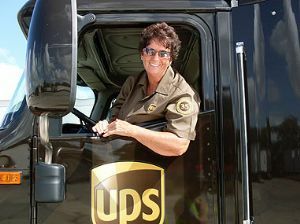 Being a truck driver is a hard job and more women are finding that it is the right job for them. Of more than 3 million truck drivers in the United States, more than 200,000 are women and that figure is up more than 50% since 2005 and the numbers are growing. Stereotypes persist that women lack the physical strength and toughness necessary to drive the big rig, but statistics show that women drivers are less likely to have accidents and safety violations. There is a shortage of over-the-road truck drivers and now is a great opportunity for women to join the trucking industry. There are a number of internet sites that can help women find a job and network with other female drivers. Start with ladytruckdrivers.com. Women have several challenges in the trucking industry. Some truck driving work is physical and requires that drivers be in good shape, and like a man, women can suffer back, shoulder or other injuries. Women also have more safety concerns than men. They are more likely to be assaulted and must take special precautions. A woman has to take care of herself on the road, but more women are learning that it is the right job for them. As more women join the ranks of truck drivers, they are networking and learning from each other how to meet their unique challenges.